Carl’s Jr. has launched a new ad campaign, titled “SpielBurgers”, to introduce a series of five Charbroiled Sliders that honor the legendary director Steven Spielberg. 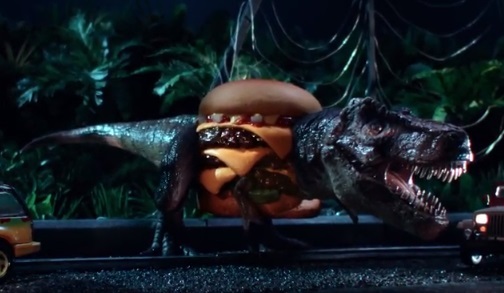 Close Encounters, E.T., Jaws, Jurassic Park and Ready Player One are the five movies directed by Spielberg and chosen by the fast-food chain as the new names of its mini-hamburgers, now called Charbroiled Sliders and available on the menu at $1. Each SpielBurger is promoted through a dedicated spot that recreates a scene from the above mentioned movies, with original soundtrack music serving as soundtrack for the spot. The new name, announced Monday, March 26, as a tribute to Steven Spielberg’s latest movie, Ready Player One, will be promoted on social media with no changes to menu boards or in-store signage. This is not the first time Carl’s Jr. promotes movies in its TV spots. The Amazing Spiderman (2012), Man of Steel (2013) and X-Men: Days of Future Past (2014) were also featured in commercials. As for celebrities starring in Carl’s Jr. advertising campaigns, Paris Hilton, Kim Kardashian and Charles Esten are to be mentioned. Earlier this year, in February, actor Matthew McConaughey began doing voiceovers for Carl’s Jr.